You’ve probably got a home generator for one reason: to make sure you’ve got electricity when you need it, especially in the case of a natural disaster or other emergency situation. 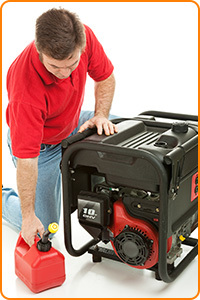 You cannot put off regular generator maintenance and just hope that you won’t need it for another year. You have to take care of your generator if you want it to take care of you. Call Asbury Electric for regular inspections, maintenance and repairs. Our lead generator electrician is the best in the business. He was a Chief Maintenance Technician in the Coast Guard for more than a decade, and he really knows his stuff. Whatever kind of generator you’ve got, Fred’s got you covered. Need a new generator? We also sell and install Kohler and Generac generators. We’re meticulous when it comes to installing your generator, and offer 18-month, interest-free financing so you can get your generator now, when you need it. Our service agreements including testing your generator once or twice a year by simulating a power outage and testing your system under load. We make sure that your transfer switch and generator are working properly. Then we do a complete service including changing the oil, filters, and spark plugs and doing a complete safety check. One day, your safety may depend on the reliability of your generator. We’re here to make sure that if that day comes, your generator fires right up and delivers the power you need. Give us a call to learn more.